Sustainability is one of the core values of Royal Mosa. The Dutch ceramic tile company aims to support the well-being of people in their homes and work spaces. Now, Mosa is participating in the Reversible Experience Modules exhibition. Mosa’s contribution to the exhibition is proof of its thinking beyond tiles as an isolated product: the tiles are part of a whole system or solution and support the circularity of a building and the materials it is made of. The idea of this new kind of exhibiting is ideal to convey the philosophy of sustainability: The Reversible Experience Modules exhibition displays more than 70 products and systems designed for reuse, recovery and recycling, and available on the market today. Together, they form an integrated exhibition showcasing how to realize adaptable, modular and circular buildings. Mosa will be demonstrating two systems: The modular flooring system (powered by Ars Ratio) with Solids. All elements of this system can be reused. Secondly, Mosa is presenting a ventilated facade system with Terra Beige & Brown. 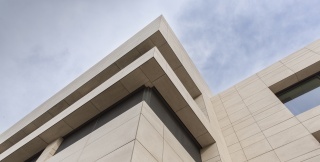 For the facade, the tiles have been mechanically anchored in a ceramic facade. The tiles can also be applied in other configurations and can be removed from the facade. Mosa tiles fit well into the idea of the exhibition. They are Cradle to Cradle Silver certified, thus contributing to the sustainability concepts of building. The aim of the exhibition is to show how an entire building with all products and materials can be fully reusable and recyclable. Based on this the exhibition will be a travelling showcase; Starting from Brussels, it will make its way through different shows in Europe. Planned stops are already set for ecobuild 2018 in London, Building Holland in Amsterdam and Kamp C in Westerlo. More locations might be added during the year. During the different shows, visitors can have a detailed look at all aspects as well as join workshops or presentations. For an update on the schedule of the workshops and presentations as well as new stops, have a look at www.epea.nl.